The building at 607 Fillmore opened as the Fillmore Savings and Loan. Established on March 29, 1909 under the name, Polish Co- Operative Savings & Loan Association the bank was run by Poles to serve Poles. The first location of the bank was based out of the office of Mr. Nowicki at 607 Fillmore, but soon the S & L would need a home of its own. In 1925, Mr. Wladyslaw H. Zawadzki was hired to build a bank that could be both next to and connected to Mr. Nowicki’s house. The completed bank at 617 Fillmore was designed with a classic Greek flair, including a tympanum with title of the bank emblazoned on it. The Polish Co-Operative Savings & Loan Association have a temple built to its financial prowess. The 1930s were an important decade for the Polish Co-Operative, first they changed their name to the Kasa Savings and Loan Association and then they moved from their home at 617 Fillmore to their new home at 700 Fillmore. 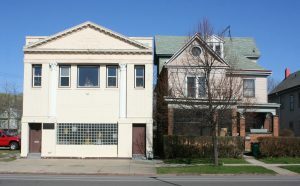 The building would later serve as the Ives Branch of the Buffalo Public Library and in 1965 as the headquarters of the Polish Army Veterans Association Post No 1. It is now a private residence.